Smoking cigarettes used to be a sign of fashion, or being cool; however, with more scientific and medical research revealing the harmful side effects of tobacco, fewer people are smoking. Still, many people continue to smoke, and not only increase their chance of developing lung disease, heart disease, stroke, and COPD, but they also are doing severe damage to their dental health. Smoking can adversely impact your smile and increase your likelihood of developing diseases like gingivitis and mouth or throat cancer. Bad breath and tooth discolouration are common side effects from smoking, but an increased build-up of plaque and tartar on the teeth is very common, as well. These dental problems are not easily brushed or flossed away, and the stains on your teeth can be difficult to remove. More severe dental health side effects caused from smoking include inflammation of the salivary glands on the roof of the mouth, a loss of bone in the jaw, risk of leukoplakia, as well as an increased risk of developing gum disease and oral cancer. Not only can you sniff out someone who smokes by the tobacco smell that clings to their clothing, but you can also tell if someone’s a smoker by their teeth. Your teeth, like your skin, have pores. When someone smokes, the nicotine and tar in the tobacco enters the pores, just like dirt into your skin, and causes the teeth to turn yellow and brown. When nicotine is combined with oxygen, it oxidises and turns yellow, so this means, that even though many people have switched to smokeless tobacco, their teeth will still become discoloured. While it may not seem like a severe health hazard for someone’s teeth to discolour, discolouration of the teeth can lead to severe gum disease, known as periodontal disease. Periodontal disease is entirely preventable and can be reversed, but continued smoking can lower the chances of successful treatment because it leads to the destruction of the supporting tissues of the tooth. In the early stages of gum disease, bacteria build up on your teeth, causing plaque and tartar to cultivate. In later stages the structure of your gums diminishes, spaces grow in between your teeth and gums and become infected. Alongside severe pain and discomfort from your gums becoming infected, your teeth can eventually fall out, break down, or need to be extracted. Do Pipe and Cigar Smoking Cause Dental Problems? While cigarette smoking seems to receive a bad reputation because of its severe side effects, pipe and cigar smoking often are not placed into the same category as cigarettes. However, they are not exempt from causing their share of dental issues. 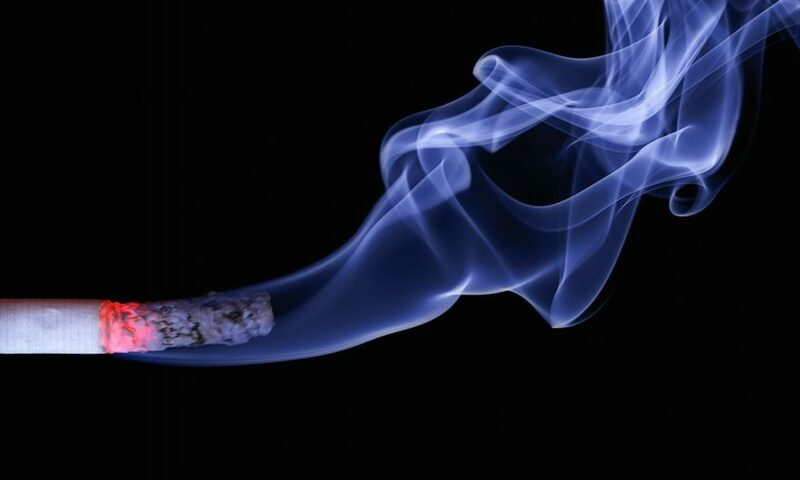 Similar to smoking cigarettes, cigar smoking can lead to tooth loss and alveolar bone loss. Pipe smokers, as well, are at risk of tooth loss. Bad breath, stained teeth, and gum disease are still risk factors for pipe and cigar smokers. Is Smokeless Tobacco Safer than Cigarettes? It’s fair to assume that any form of tobacco is unhealthy for you and your dental health. Chewing tobacco, snuff, and dissolvable tobacco cause severe health problems, regardless of whether or not you are smoking them. Chewing tobacco and snuff contain at least 28 chemicals that are proven to increase the risks of dental health, as well as oral and throat cancers. According to the American Cancer Society, smokeless tobacco products provide about the same amount of nicotine as regular smokers receive in cigarettes. Gum disease is a common side effect of smokeless tobacco, causing your gums to pull away from your teeth, leaving them exposed and at an increased risk of decay. Teeth sensitivity is very often developed, and cold or hot foods and drinks can lead to severe discomfort. The increased sugar added to smokeless tobacco to make the taste more appealing can also lead to tooth decay. Overall, smokeless tobacco, while there is no inhalation of smoke, does not reduce the dangerous side effects that tobacco can have on your dental health. It is never too late to quit smoking or using other tobacco-related products. Even if you have been smoking for a long time, the sooner you quit, the sooner you can get your dental health back on track. Gum disease, which is six times more likely to occur in a smoker, than a non- smoker, can be reduced by half by even just reducing the levels of smoking to a half a pack a day. It has also been shown by a study done in the Journal of American Dental Association, that lesion leukoplakia completely disappeared in over 97% of their patients who quit using smokeless tobacco products, within six weeks. There’s no time like the present to reduce your risk of cancer, as well as bad breath, gum disease, and the countless other health risks that are caused by smoking tobacco products, as well as smokeless tobacco products. Visiting Amersham Dental can help you decide the best approach to kicking your smoking habit. Dental professionals can provide you with oral health education or a hygiene cleaning to help you reverse the effects of smoking on your teeth and gums and screen you for oral cancer. How Can I Quit Tobacco? There are many methods to quitting a tobacco addiction, and they will work differently based on the person. Visiting your dentist or doctor is an excellent way to start the process of ending your tobacco usage. They can recommend certain medications to help the cravings subside, such as Zyban (which requires a prescription) or nicotine gum and patches. While some people can quit cold-turkey, for others, the path to living without tobacco is much more difficult, and there are resources to help. Whether that means joining a support group, or smoking cessation class, a good place to start is your dentist.